Oatmeal = breakfast. It just does. Early morning oatmeal before getting ready for my run. A filling bowl of warmed autumn oatmeal after one of my runs with lots of cinnamon roasted apples plus some roasted bananas in there too. If you follow me on instagram, you may have seen my side dish roasted veggie lunch from The Little Beet. 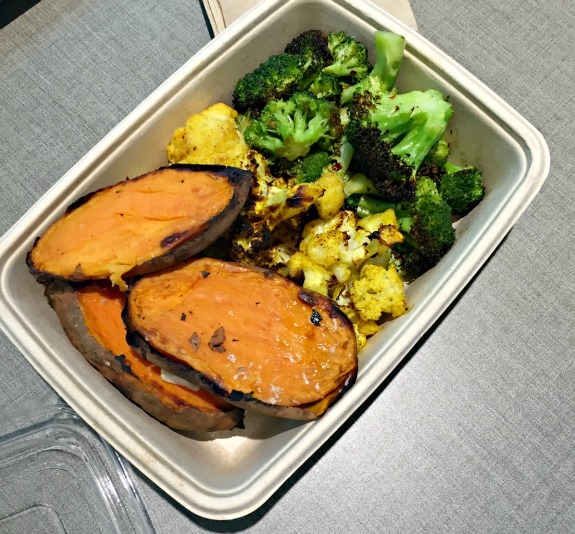 I normally choose Maoz when I am standing in the dining district at Roosevelt Field mall but on this particular afternoon, I thought I wanted Red Mango but then walked by The Little Beet, saw the roasted sweet potatoes and made my decision. All side dishes, no protein < – such a rebel. Would you believe that I actually had leftovers the other night from my salad at The Cheesecake Factory? This never happens! I am known for finishing my plate but maybe because we ordered the Thai Lettuce Wraps as an appetizer first, I was filled enough to leave some salad and skip over to dessert. I will admit it was exciting to bring home the leftover salad and have it for lunch the next day. I doctored it up with some leftover roasted sweet potato wedges and a lentil/quinoa mix that I had made plus extra avocado. I got a lot of use out of the batch of lentils and quinoa I made a few days ago. 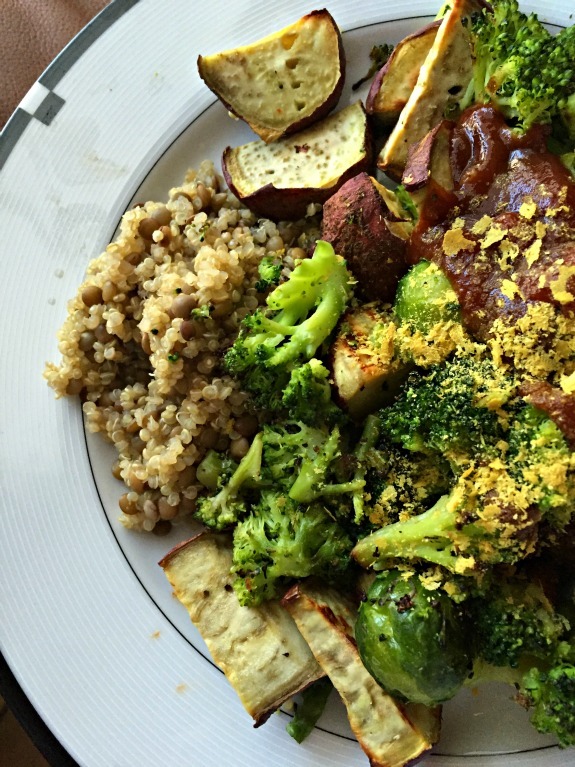 In addition to adding it to the above salad, I made this yummy power bowl too with roasted Japanese sweet potatoes, broccoli and brussels sprouts topped with barbecue sauce and nutritional yeast. 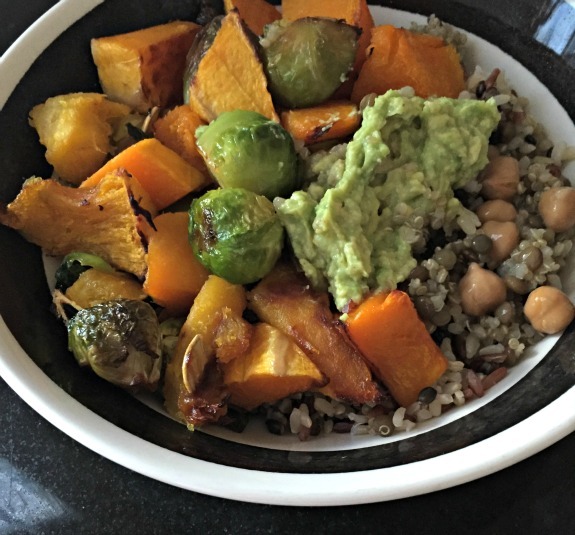 I also added the lentil and quinoa mix to my favorite fall recipe. I modified the recipe a bit because I just didn’t have the patience for all of the ingredients. I roasted butternut squash, acorn squash and brussels sprouts but skipped the sweet potatoes, as much as I love them, because I just couldn’t cut up another thing. I made the coconut rice via short cut method (I used the steam bag of brown rice medley and mixed in coconut milk), quickly whipped up the called-for guacamole and replaced the nuts, cheese and cranberries with the lentils, quinoa and some chick peas which were leftover in the fridge. 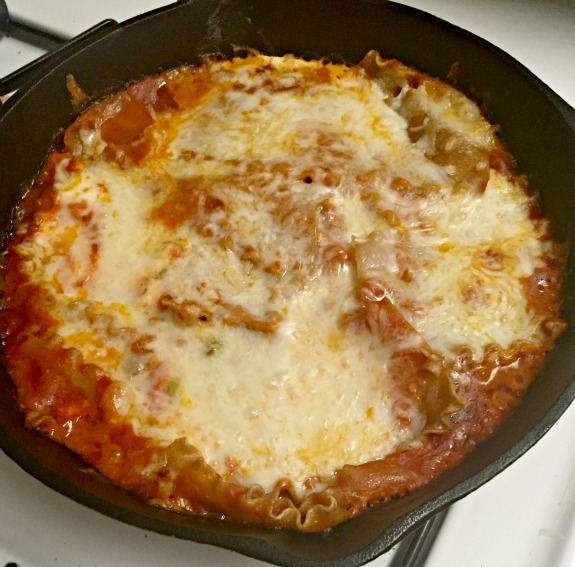 I made my cast iron skillet whole wheat lasagna per the meal plan Sunday night and really should share the recipe one of these days because it’s so easy and customizable. I am still bent out of blogger shape that I didn’t get a picture of my Linda’s Fudge Cake dessert from Saturday night! While the usual apples with peanut butter are still going on, I have been in the mood for hot chocolate. 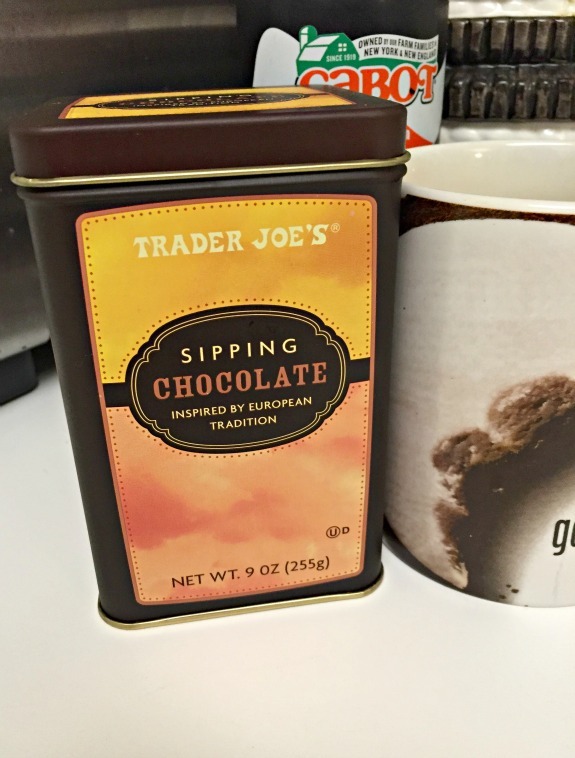 I picked up this Sipping Chocolate from Trader Joe’s and simply adore it. It says it’s not quite a hot chocolate and not really a chocolate milk but I don’t even understand those claims because this Sipping Chocolate mixed with warmed almond milk and some whipped cream tastes like a decadent hot chocolate to my taste buds. I like my hot chocolate with a spoon. Anyone else? 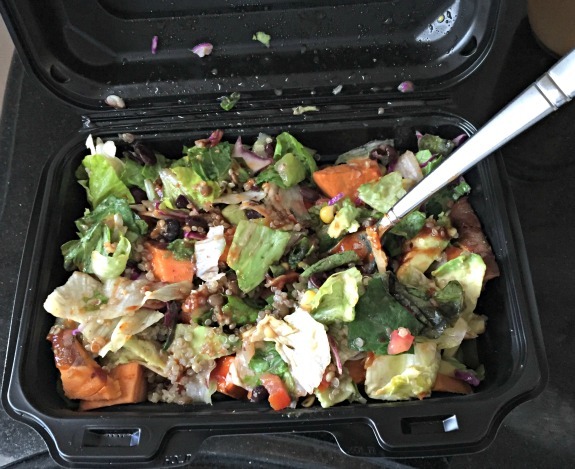 Do you often bring home leftovers from restaurants? 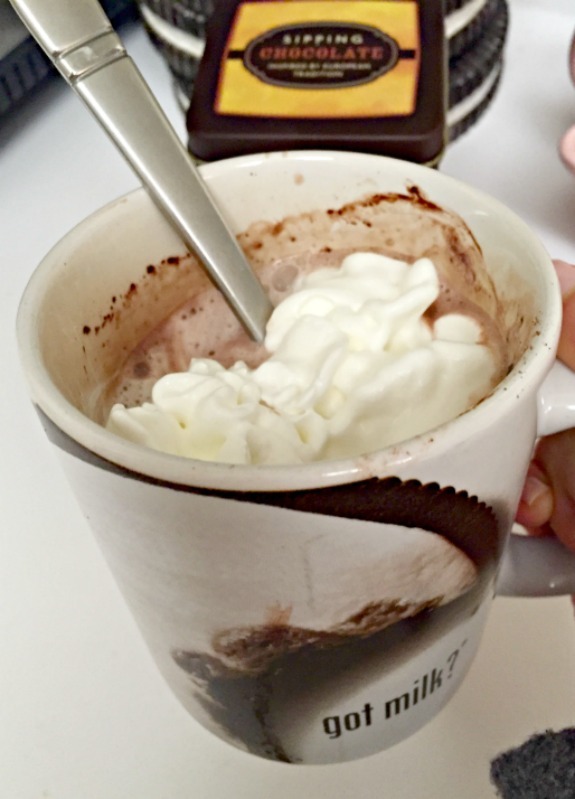 Hot chocolate – with a spoon or without? I usually don’t have leftovers to bring home from restaurants, but its always a nice treat when I do. I especially love brining home leftover pizza from this one really good place (where the portions are huge, so we do usually have leftovers there). Hi, my name is hungry-after-reading-your-post! Seriously, you had some really delicious meals lately. That oatmeal is calling my name as are the power bowls. I really need to make one of those soon. I don’t eat out often due to lack of options [a downside of countryside life] but the times I’ve been to Vapiano before I always brought back leftovers. Their servings are huge and it’s nice to have handmade pasta to incorporate into your next meal. The oatmeal is seriously the best part of my day, every day. Always so good! 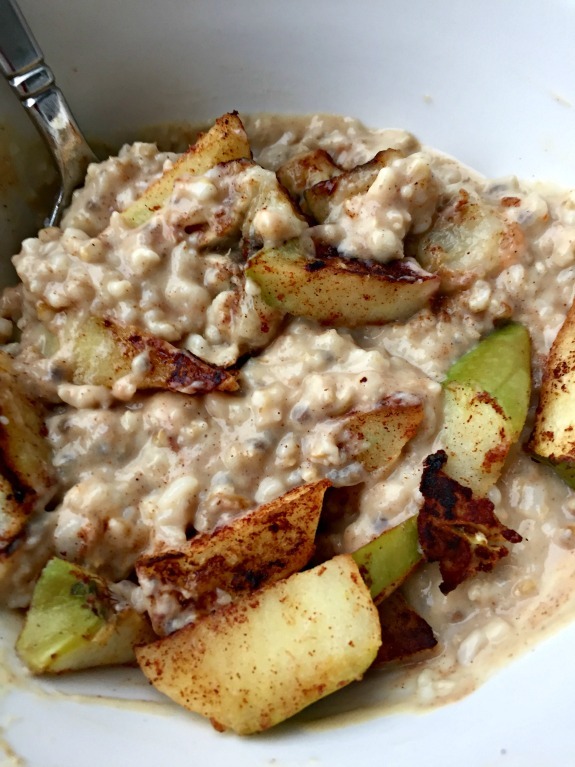 Love that autumn oatmeal and the roasted fruit, that sounds delicious! I’m loving all the roasted veggies too. I’ve been eating more broccoli and brussels sprouts since I haven’t been running and my stomach seems okay with it. Alex and I don’t really “do” leftovers. Not because we are averse to them, but because we hoover anything and everything and will finish dishes even if we are packed to the gills full. Or I will get a to go box and then eat whatever I am carrying ion the way home. We have issues. Sounds like me! Totally eat until I am overly full, leaving nothing much for a worthy leftover. And yes to eating the take out on the way home, that’s what happens should I try to leave Whole Foods with something from the food bar. I need to find that sipping chocolate! I forget how much I love hot chocolate! I really like it, definitely recommend it. I had seen it last year too but didn’t buy it until now. Agreed. Way too many of the NY restaurants are pricey with small portions which is why I am always happy at The Cheesecake Factory. I love it when we have leftovers from eating out, but that rarely happens because I’ll eat until I’m stuffed! We bought hot chocolate for our camping trips, which will be my first hot chocolate of this year. I rarely have leftovers for the same reason! I think you would like this recipe because it’s one of those nonrecipe recipes and makes lasagna really simple. I will share it I promise and I will even email it to you later should you feel like cooking tonight. Always drink hot chocolate with a spoon!! No other way to do it. I haven’t had cooked apples in my oatmeal in forever, and think I need to tomorrow. Makes it feel even more like fall! 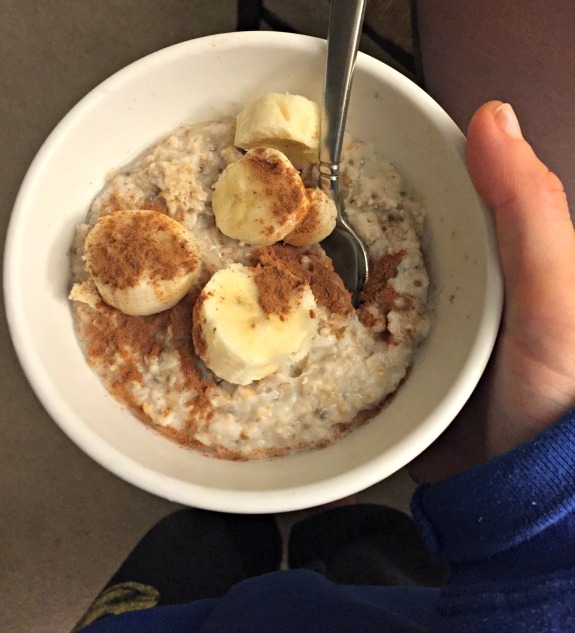 Oatmeal to start the day and hot chocolate to end the day sounds like the right way to do it! I didn’t have time to have oatmeal before my run this morning and I definitely felt the lack of fuel. Hot chocolate is my fav … Although I don’t think I’ve tried the sipping hot chocolate before. Definitely w/ a spoon … Because you gotta scoop up the marshmallows before they fade away! Even my son likes the sipping chocolate- try to find it and give it a try.